This is Eric's Extra 300 FunTiger by Thunder Tiger. It is shown here hanging inverted from his ceiling by a hook directly under the CG. 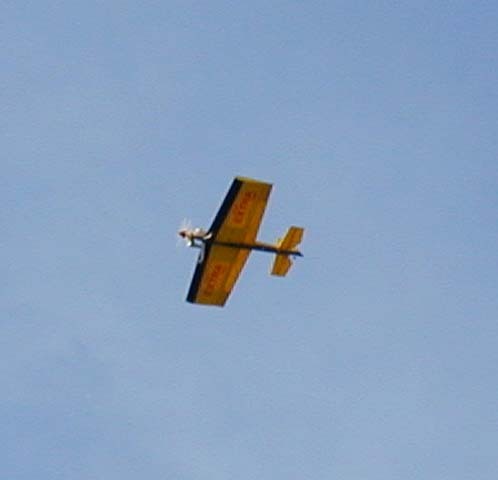 It is powered by an OS .46FX that had been on his Sukhoi. This plane is an ARF, and doesn't look anything like an Extra 300. It behaves very much like my Fazer. It's heavier, but this is offset by a more powerful motor. It has just a little bit better than a 1:1 power:weight ratio. The controls are quick, and the plane is slow. The covering is terrible. When we opened the box, one of the wings has a large hole in it. Thunder Tiger sent a new set of wings at no cost, but it took 3 weeks for them to come in. 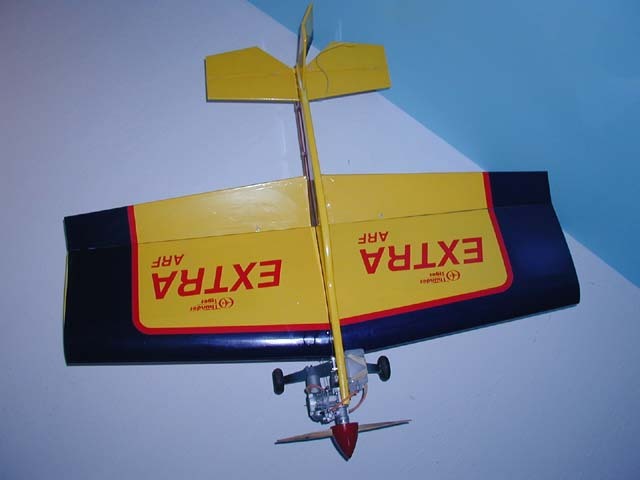 After I had finished building the plane I took it off the work bench and dropped it no more than 4 inches over a 1 quart paint can. The covering "shattered". Since I had spare wings, it was easy to fix. This covering is what is known as shelf paper. It's sticky on one side (without heat), and it is brittle. Also, seams under tension tend to unstick over time. We put the motor on a long mount, with the motor out as far as it could go. Even with that, a huge chunk of lead was required to get to the recommended balance. The directions say to mount the wings with the servo hatch side up. Ugly! I mounted the wings up-side-down works just fine because they are symmetrical. Compared to my Fazer, it's heavy; about 4 pounds Vs 2.5 pounds for the built up Fazer. It's an ARF, but there was an awful lot to do. It was no weekend project. And lastly, and I'm partly to blame here, the directions said to use a generous amount of epoxy when putting the wings on. I guess I over did it because plenty oozed out and hardened. It sticks to shelf paper real well. Even with all those complaints, we're happy with the plane. However, if I wanted another fun-fly, I don't think I'd get another Thunder Tiger.